Sir Thomas Cullinan had earlier between 1909 and 1914 made an attempt to establish South Africa domestic ware in the local market through his Conrand Company. Because of his interest in ceramics, Cullinan established a pottery at his Olifantsfontein company, which came to be known as Transvaal Potteries. Cullinan was the director of this company and director of his other better known concern, the Premier (Transvaal) Diamond Exploration Company. This however failed in the face of a preference for the cheaper imports. During its brief existence he had built a special "potters' village" and factory where he employed trained potters from Stoke-on-Trent. When the pottery closed in 1914 the British potters were sent home, abandoning the workshops, kilns and special cottages. They stood empty until 1925 when Marjorie JOHNSTONE, who was friendly with the Cullinans, persuaded them to make the premises available for a studio pottery. Ceramic Studio was established at Olifantsfontein in 1926. 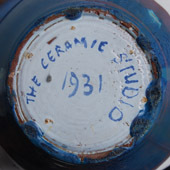 The Ceramic Studio was established in the defunct Transvaal Potteries, originally established by Sir Thomas Cullinan in 1907, by Gladys SHORT and Marjorie Johnstone in 1925 two former students of the Durban School of Art. They were soon joined by Joan METHLEY and Audrey FRANK. 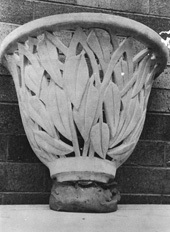 Short and Methley were keenly interested in establishing an authentic South African style within the applied arts industry These women held key positions at the Ceramic Studio of Sir Thomas Cullinan's company at Olifantsfontein, which was known as the Consolidated Rand Brick, Pottery and Lime Company Limited. 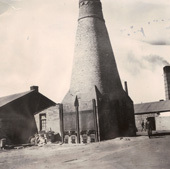 Through the work of Short and Methley, the Ceramic Studio (which formed part of the Potteries) would gain prominence. The distinctive quality of the Studio's wares was immediately appreciated by architects and designers. Spanish styles based on the Alhambra were fashionable during the 1920s and '30s, opening the way for important commissions for architectural faience and decorative tiles. The government architect, CLELAND, was the first to offer the Studio an important project: the decoration of the new Addington Children's Hospital in Durban. A further government commission was the production of 11 000 painted tiles in the Spanish and Delft styles for the new Johannesburg Railway Station. This was followed by numerous pictorial tile panels for Post Offices, Police Stations and Government Offices throughout South Africa. The designs for these panels were made by local artists: Audrey FRANK, Alfred PALMER, Wilgy VANN-HALL, Rosa HOPE and others. 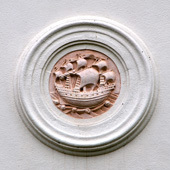 Probably the most fruitful collaboration was with the sculptor, Mary STAINBANK, who designed the bas-reliefs and fountains for the Addington Children's Hospital and, later, much of their garden sculpture. NEWHAM, a talented artist with a keen interested in artistic matters, was apparently nicknamed 'Potty Newham' because of his interest in the Ceramic Studio at Olifantsfontein. 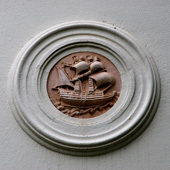 His interest in the work of the Studio contributed to their being commissioned for decorative work inside many Government buildings both in South Africa and overseas (Newham 1988). 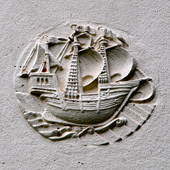 The Ceramic Studio became well known for its production of high-quality ceramic tiles which were used in various prominent civic commissions by the DEPARTMENT OF PUBLIC WORKS. 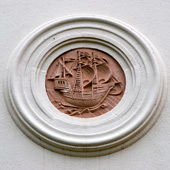 Where these tiles featured in government buildings, they very often depicted typical natural or historic scenes relating to the relevant town or region. During World War II the Ceramic Studio was faced with closure due to the loss of staff to the war effort and the unavailability of imported clays and glazes. Competition from other South African potteries is also quoted as a reason for closure. During WWII Ceramic Studio was sold and renamed Linnware in 1942. That Olifantsfontein should have been the site of so much artistic endeavour is extraordinary. That a handful of devoted women should have accomplished nearly three decades of consistently high artistic achievement and commercial success is even more extraordinary. 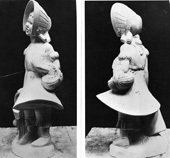 An artist such as Mary STAINBANK, who collaborated regularly with the Ceramic Studio, suffered much neglect during her career as a sculptor. This she blamed on the insensitivity of a patriarchal society. Perhaps the women of Olifantsfontein were protected by their public image - "shingled potters" are after all not as threatening as a female sculptor who mounts scaffolding to carve massive stone sculptures, dressed in workmen's dungarees. There is a watercolour by Thelma Currie titled "Ceramic Studio - The Works". 1952. Thousands of hand-painted tiles depicting scenes in the history of South Africa from the earliest days of the Cape settlement up to the present day are now being prepared at the Ceramic Studio at Olifantsfontein for the decoration of the tea room at Johannesburg's new railway station. "Many of those whose wont it was to sip their tea in Park Station Tea room and at the same time meditate philosophy on the Dutch texts painted in archaic characters on the strip around the top of the walls must have been keenly disappointed when some months ago these texts were snatched away without any warning and uninspiring paint took their place. The tea room was never quite the same. These texts lent it an air of quaint distinction which marked it off from the rest of Johannesburg. There were those who thought that the inscriptions had been ruthlessly sacrificed for appearance sake. That the authorities were guilty of no such thing was discovered by a representative of 'The Star', when paying a visit to the Ceramic Studio at Olifantsfontein he found the texts being laboriously copied by hand from the original canvass on to tiles, which in due course will decorate the new station. These tiles are, however, only a few of the 4 500 which the workers at the Ceramic Studio, under the direction of Miss Short and Miss Methley, have been painting by hand for the past 18 months. For Mr. Gerhard [sic] MOERDYK, the architect is carrying out the novel scheme of decorating the walls of the new station tea room up to the six feet level with tiles portraying the spirit of South Africa. When the work is finished will find themselves in a truly South African atmosphere. At the eye level the history of the country is to be illustrated by a line of tiles beginning with the landing of Van Riebeeck at the Cape and carrying the story right up to the present day on the Rand. Below these will be scenes, connected with the history, and then will follow illustrations of South Africa and South African life. The Dutch texts will be in the middle. The charm of these remains unimpaired as the archaic lettering has been retained and they are still in High Dutch, which has the same quaint smack about it as Chaucer has to the English ear. The pictures of the tiles are in blue paint and are exquisitely done. No trouble has been spared to make the work a success. Old prints, books, photographs and manuscripts have been obtained from all over the country and pictures from them have been copied. Materials for illustrations have been got at museums. How varied is the range of subjects could only be appreciated from the selection of tiles to be seen at the studio. There were pictures of Bushmen paintings, Zimbabwe relics, old galleons, diamond mines, Paul Kruger, wagons on trek, Dingaan and a host of other scenes and personalities of no less interest. But the illustrations are not all copies. Many of the scenes of life in South Africa are original drawings, notably a whole album which Miss Audrey Frank did on a special visit to Durban. But the painting of 4 500 tiles does not exhaust the capacity of these energetic people. Mr. Gordon LEITH is carrying out a similar scheme of decoration for the walls of the bar and lounge bar, and for this some 3 000 tiles are needed. These, however, are not going to be painted with South African scenes: They will form brilliantly coloured geometric patterns after the fashion of the walls of the Alhambra, the Sultan’s palace in Granada, Spain. It is a striking example of the thoroughness with which the work at the studio is being done, that Miss Short specifically went to Spain to study the designs. At present experiments are being carried out to secure brilliant colours. Many fascinating minutes could be spent watching the girls at work. They sit painting at benches surrounded by a medley of pots and vases of many beautiful shapes in all stages of manufacture , scattered among which are plaques of various designs – for this studio, as all studios should be, is untidy. The process is quite simple. The tile after being pressed, baked and dipped in an opaque glaze is handed to a girl who punctures the picture from a sheet of tracing paper on to its surface. This bare outline serves as a guide for the painting which takes from ten minutes to an hour to do. Oxide of cobalt which is black when put on is then applied with a camel hair brush. The tile is now ready to be sprayed with transparent glaze powder. When this has been done it's then sent to the ovens and comes out a beautifully glazed tile. There it is. Seven thousand tiles to be painted by eight girls in two or three months. 'We dream tiles,' said Miss Short."